Burt Nelson was one the Party members who helped rebuild unionism on the waterfront. A leader in the 1934 longshoreman's strike, he served during the 1940s as President of the Seattle CIO Council. Photo: CPUSAThe Pacific Northwest saw a great deal of Party union building activity during the 1930s, although it is hard to figure the exact dimensions of Party influence or the numbers of Communists in any particular union since many wanted their affiliation kept secret due to fears of attack and ostracism. One sphere where Communists were effective was in the various industries where there was a high percentage of immigrant workers. A good example of this is the canning industry where the Cannery Workers and Farm Labor Union that formed in 1933 was alleged to be Communist-dominated. [iii] The Alaska canning industry had a high percentage of Filipino workers, some of who were drawn to the CP because of the Party's position against racism and imperialism. Communists argued that one 'ism' existed because of the other and that the Party was fighting against both. [iv] (on the early years of the union see Filipinos and the Cannery Workers Union by Crystal Fresco). Communists were equally influential in the maritime industry. [vi] Working on the docks or on the decks and in the holds of ocean-plying cargo ships is hard and dangerous work and it tended to attract a transient workforce of rough and brawny men. One of the main reasons why the waterfront workers were open to Communist activity is that these men were used to visiting far off ports and interacting with sailors on ships from all around the world. This interaction led to an ability to accept and tolerate differing opinions and beliefs and it is in this setting that radical ideas were able to flourish. In 1934 the longshoremen reorganized under the leadership of Harry Bridges who was an Australian seaman. This organization of longshoremen created a powerful union that would play an ongoing and pivotal role in the West Coast maritime industry. Initially affiliated with the International Longshoreman's Union (ILA), the West Coast locals joined the CIO in 1937 and became the International Longshoremen and Warehousemen's Union (ILWU). 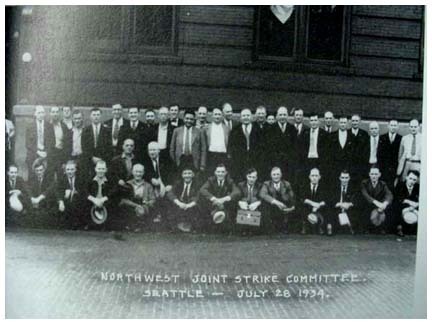 Joint Northwest Strike Committee outside Seattle Labor Temple, 1934. 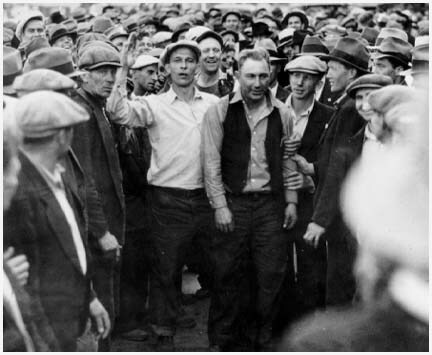 Courtesy Pacific Northwest Labor History AssociationThe CP was very involved on the waterfront and in 1934 – the year of the great West Coast waterfront strike – the Party played an important role in the strike and in outlining the demands. 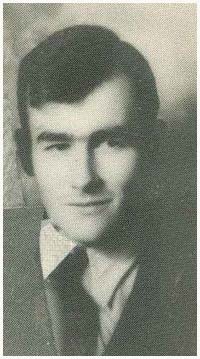 A friendship and fellowship formed between Bridges and another Australian seaman named Harry Hynes, who was the founding editor of the Waterfront Worker, a Communist paper in San Francisco. While there has always been controversy over whether or not Harry Bridges was himself a member of the Communist Party, it is widely accepted that the Longshoremen's Union had one of the most radical and leftist track records of many of the unions operating at the time. Whether or not Bridges was a Communist, the ILA (which became the ILWU in 1937) pursued many ideals and beliefs that were central to the CP and its efforts within the labor movement. 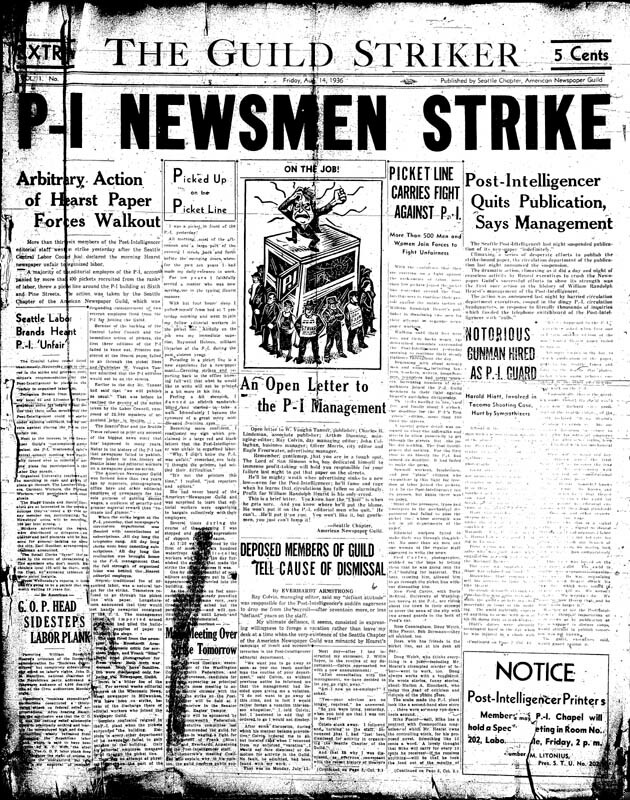 The Guild Striker was the official paper of the 1936 Newspaper Guild strike against the Seattle P-I. For more information on this paper click the title above.The owner of the Seattle P-I was none other than William Randolph Hearst, the newspaper mogul who owned countless papers nationwide and was fervently anti-labor and anti-Communist. Hearst, an open admirer of Hitler and of what the dictator had done for Germany, was quoted as saying, "Fascism will only come into existence in the United States when such a movement becomes really necessary for the prevention of Communism. "[x] Obviously, Hearst was loath to welcome a union at his Seattle newspaper, especially one that was founded and led by a Communist. The first big test for the fledgling union came when management fired two long-standing and well-respected writers on the P-I staff, thereby pushing the Guild members to act. The firings were added to the long list of staff complaints that included policies such as hiring young, inexperienced writers who were willing to work longer hours for less pay, firing longtime-staffers to make room for these upstarts, and a flat-out refusal by the executive staff of the paper to recognize the Guild chapter. Finally, the fledgling union had the impetus it needed to take on the brute forces of Hearst. On the morning of August 8, 1936, thirty-five Guild members set up a picket line outside the Seattle P-I offices that stood at the intersection of Sixth Avenue and Pine Street in downtown Seattle. These were not the burly, strong men of the waterfront or lumber camps, these were reporters, librarians, and key editors – but that did not matter for they were labor and a united front of labor answered their call for help. What started as thirty-five now grew to over 1,000 picketers surrounding the building. They were even joined on the picket line by the Mayor of Seattle, John Dore, who was successful in his mayoral bid due in large part to the support of labor. This was a strike of the entire labor movement in Seattle that mobilized against Hearst and everything he stood for. The paper was shut down, and by November 25th the Guild had achieved its goal: William Randolph Hearst was forced to formally recognize the Seattle chapter of the American Newspaper Guild. Among the stipulations of the settlement were the establishment of a forty-hour week in six days until March 1, 1937, and a forty-hour week in five days thereafter; sick leaves with full pay; two-week vacations for employees of more than one year; and a severance plan with one week's pay for each year after one year and up to five weeks. While this strike was a victory for all of organized labor in Seattle, it owed much to the CP whose members not only started the Guild local and worked fervently to support it, but also refused to abandon it in a dark time and pushed many to stand up to overwhelming odds and take on a fight that few believed could be won. Communists were also present at the forming of a union that represented workers in the lumber and pulp mills and in timber camps throughout the Northwest. Loggers, miners, and seasonal agricultural workers had formed the core of the Industrial Workers of the World (IWW) in the years leading up to World War I. This early organization found success organizing in the Northwest logging camps by promoting industrial unions that would bring all the workers in the industry under one umbrella union. They believed in worker ownership of factories, a 40-hour work week, and sanitary conditions in the logging camps – and for believing in these 'rights' they were branded as dangerous radicals. 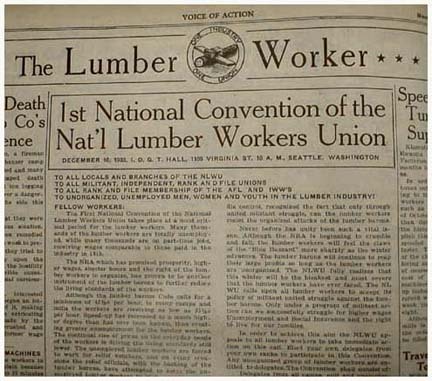 An example of the strength of the IWW in the logging industry of the Northwest came in 1917 when 50,000 lumberjacks went on strike and shut down the entire industry from Northern California to British Colombia, Canada. [xii] But during the 'red-scare' of the early Twenties the government cracked down on the IWW and all but squashed it, yet its legacy lived on – especially in the lumber industry. This legacy rematerialized on September 18, 1936 at a convention in Portland, Oregon, where the Lumber and Sawmill Workers, the Plywood and Veneer Workers, the Box Shook Workers, the Shingle Weavers, the Boom-men and Rafter-men, the Furniture Workers, the Pile Driver Workers, and many, many more all united under the Federation of Woodworking Unions, bringing together approximately 72,000 workers under one banner, later renamed the International Woodworkers of America (IWA). By uniting all those workers whose trades revolved around the manufacture, manipulation, or finishing of material made of wood under the single banner of the IWA, the spirit of the IWW was handed down to a new generation of lumbermen in the Northwest. The formation of the IWA was in direct response to grievances against William Hutcheson, President of the United Brotherhood of Carpenters and Joiners (AFL) for his ultra-conservative policies and his mishandling of the dues paid by the lumbermen. Hutcheson took the dues paid by the Northwest lumbermen and refused to allow them a vote in union matters, prompting the lumbermen to form their own union, the Federation of Woodworking Unions (later the IWA), and threaten to join the CIO. The General Secretary of the Carpenters’ responded that if they proceeded with their threats to leave the AFL and join the CIO, the lumbermen would get "the sweetest fight you ever had. "[xiii] Under the leadership of Harold Pritchett, who was named by several people as being a member of the Communist Party,[xiv] the IWA moved towards affiliation with the CIO and left the Carpenters. The IWA had close ties to Bridges' ILWU, since all of the lumber that they handled eventually led to the waterfront, where it was shipped off throughout the world. A friendly relationship with the longshoremen made their work easier. They were also very involved in organizing drives throughout Washington among different crafts like match workers in Tacoma and lumber mill workers in Elma, Everett, and Longview. Party members were also involved in the organization of the Cannery Workers and Farm Laborers Union, which later became ILWU Local 37. 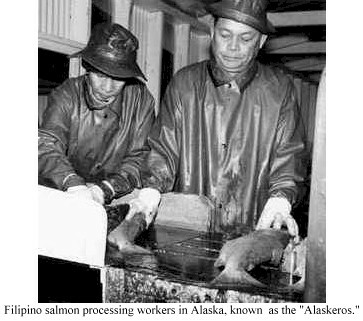 Filipinos working in the Alaska salmon canneries in the summer and the "farm factories" of California and eastern Washington in other seasons were the heart of this union. Photo courtesy ILWU Local 19, Seattle. For more see see Filipino Cannery Unionism Across Three GenerationsThe official paper of the IWA was originally The Timber Worker (later called International Woodworker), which was published out of Aberdeen, and had a circulation of about 25,000 in 1938, reaching 39,000 in 1940. While the paper was never overtly Communist, the Party exercised editorial control. Nat Honig, former editor of the Waterfront Worker — the CP’s San Francisco paper — moved to Seattle in 1937 to edit The Timber Worker. [xv] The newspaper featured articles and opinion pieces that discussed issues that tended to be very communistic in nature, discussing anti-fascism, class solidarity, intense anti-war sentiments, and civil and women’s rights. The IWA remains a good example of where a long tradition of radicalism and fraternalism survived attacks from all sectors of society, yet the spirit of the laborers never dimmed and their goals were never forgotten. Communists may also have been involved in the formation of District Lodge 751 of the International Association of Machinists and Aerospace Workers, representing Boeing workers. This union first formed in 1935 as Local 751 of the International Association of Machinists, which was an AFL-affiliated international. Starting with a mere 35 members, the local quickly grew to just over one thousand in 1937 and by May of 1939 boasted a membership of about 2,100. [xvi] While it is hard to pinpoint specific members of the CP involved in the efforts to organize this union, in 1940 Cliff Stone — editor of the Aero Mechanic, the official paper of the union — issued an unauthorized edition of the paper in which he accused over 50 members of the union of belonging to the CP. Among those named were Barney Bader, President of Local 751, and Business Representative Hugo Lundquist. These two men were eventually expelled from the union and fined, having been "found guilty of subversion — that is, being advocates of Communism..."[xvii] While this does not necessarily mean that these men were Communists, it does go to further suggest that the CP was involved in all imaginable industries and unions and that its presence was felt almost everywhere. 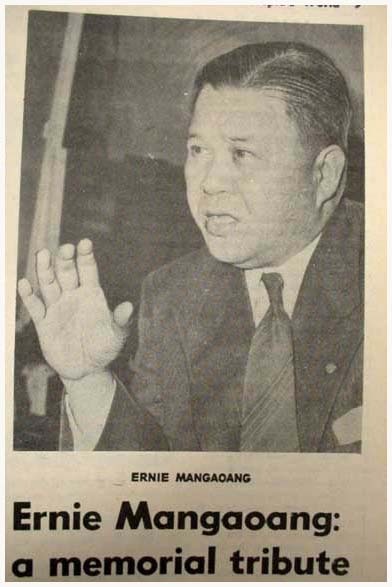 Born in the Philippines in 1902, Ernesto Mangaoang helped organize the Alaska Cannery workers and held a succession of top offices in the Cannery Worker's and Farm Laborer's Union. His death in 1968 prompted this memorial tribute in the Peoples World June 8, 1968. Another CP-influenced union formed on the campus of the University of Washington in 1935 with the formation of Local 401 of the American Federation of Teachers. While the Local was part of the AFL, several outspoken members like Harold Eby, Hugh DeLacy, and Ralph Gundlach – all were named as members of the CP at one time or another – argued for affiliation with the CIO. [xviii] While the union kept moving farther and farther to the left and tended to support the "Communist line," the President of the University, Lee Paul Sieg, felt that its 'leftist' activities might cause the Legislature to interfere in the internal affairs of the university. [xix] Little did he know how right he was, for in a move that was a possible foreshadowing of what was to come, on January 23rd of 1939 State Representative D. L. Underwood (D-Seattle) called for an investigation by the House of Representatives into 'communist activities' at the University of Washington to see if the state could stop the UW from hiring Communist speakers or professors. He was reacting to the University's plan to hire Harold Laski, a well-known British Marxist, to lecture on campus about the aims of the British Labor Party. Laski was ultimately paid by a private endowment and did not use any state funds, but the actions taken by Representative Underwood stand out as another case of red-baiting and show what people were facing when they openly associated themselves with the CP or any kind of Marxist teachings. This was to be only the beginning of the hunt for 'reds' on the campus of the University. Part of this legacy must also include the reputation that the members had of being passionate fighters for worker rights and fair treatment of all workers regardless of race. The activities of the Communist Party spread across all industries and across all racial, ethnic, and social lines and this was a part of the defining aspect of the efforts of the party — for they saw the victories of any one worker as a victory for all workers. [i]Bert Cochran, Labor and Communism: The Conflict that Shaped American Unions (Princeton: Princeton University Press, 1977), 12. [v] Fred Cordova, Filipinos: Forgotten Asian Americans (1983), 73-80. [viii]William E. Ames and Roger A. Simpson, Unionism or Hearst: The Seattle Post-Intelligencer Strike of 1936 (Seattle: Pacific Northwest Labor History Association, 1978), 11. [x]Ibid., 16. This quote was apparently taken from a book by Arthur M. Schlesinger, Jr., The Age of Roosevelt: The Politics of Upheaval (Boston: Houghton Mifflin Company, 1960) 85. [xiii]The Timber Worker. This was the official newspaper of the IWA and it reported the Duffy quote in an issue sometime near the end of 1936, most definitely after the convention. [xiv]Hearings before the Committee on Un-American Activities; House of Representatives, Eighty-Third Congress. June 14-19, 1954. Pritchett was named by John P. Frey who was President of the Metal Trades Department, AFL; Harper L. Knowles who was the chairman of the Radical Research Committee of the American Legion, Department of California; by Captain John J. Keegan who was Chief of Detectives for the Portland, Oregon Police Bureau and others. Of course this is highly biased testimony, but it can be looked on as being somewhat credible because Pritchett was so often named. [xv]Canwell Hearings, Nat Honig testimony, 228. [xvi]John McCann, Blood in the Water: A History of District Lodge 751, International Association of Machinists and Aerospace Workers (Seattle: District Lodge 751, 1989), 25. [xviii]Jane Sanders, Cold War on the Campus: Academic Freedom at the University of Washington, 1946-64. (Seattle: University of Washington Press, 1979), 24. All three of the mentioned men were named in the Canwell hearings..